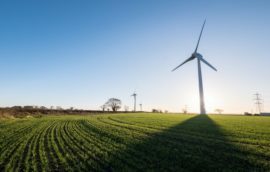 Corporate renewable energy procurement is currently on track to exceed 5 gigawatts (GW) in 2018, according to figures announced recently by the Renewable Energy Buyers Alliance, which is so far tracking a new record of at least 4.96 GW worth of new capacity already acquired this year. 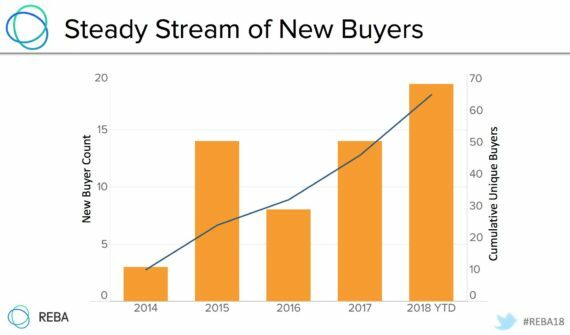 So far this year (as of October 19) there have been 59 deals signed by US corporates for a total of 4.96 GW — already a new record over the previous high of 3.22 GW set in 2015, and representing the most first-time buyers in a single year. These are the latest figures from the Renewable Energy Buyers Alliance (REBA) — an initiative led by the Rocky Mountain Institute, World Wildlife Fund (WWF), the World Resources Institute, and Business for Social Responsibility. “For 2018 specifically, there are two key driving factors behind the growth in corporate renewable energy procurement,” said Kevin Haley, a Program Manager at the Business Renewables Center, who spoke to me via email. “First, companies continue to see renewable energy as good for business and are doubling down on renewable energy and carbon emissions commitments. As companies have announced these public commitments over the past few years, the energy and sustainability teams inside the companies have been working to meet those goals which are now resulting in new renewable energy deals. Importantly, REBA’s numbers show that corporate renewable energy procurement is beginning to become more mainstream, and is spreading through even more sectors. 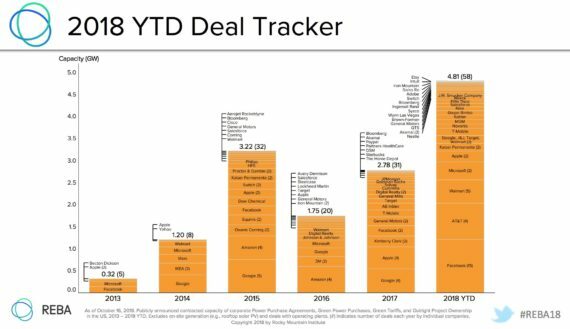 In 2014 it could charitably be said that three sectors were interested in renewable energy procurement — IT, consumer discretionary, and consumer staples — for a total of 32 MW over 5 deals. In 2015 this expanded to seven sectors, but IT accounted for 52.6% of the 3.22 GW over 32 deals. In 2018, however, IT’s share of procurement is down to only 29% while the other six sectors — consumer staples, consumer discretionary, financials, healthcare, industrials, materials, and telecommunications — have begun accounting for increasingly larger shares. The geographical location of corporate renewable energy procurement is expanding as well, growing from only 9 states in 2013 to a total of 26 states so far this year.